The future of Formula 1's qualifying format remains shrouded in confusion after bosses failed to agree on a change for the next race in Bahrain. 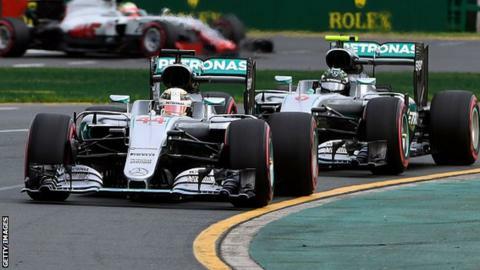 Teams decided at the season-opening race in Australia to ditch the new elimination system and revert to the one that had been in place for 2015. But when they met on Thursday to discuss possible options, returning to the old format was not one of them. F1 boss Bernie Ecclestone says there will be more talks early next month. The new format, which saw drivers eliminated every 90 seconds through three sessions of qualifying, came in for criticism in Melbourne last weekend. That's because it led to an empty track for the last four minutes of the top-eight shootout as teams saved their tyres rather than do another lap. At an emergency meeting on Sunday, teams agreed unanimously to revert to the 2015 format. This consisted of three knockout sessions, with the slowest cars only eliminated after each session had finished.. However, this option was not on the table when the F1 Commission finally met on Thursday. or stick with the elimination format for the first two sessions of qualifying but with an extra minute's duration, followed by a final qualifying session run as it had been in 2015. As neither had been discussed by the teams in advance, agreement was not reached. The F1 Commission features Ecclestone and representatives of all the teams, governing body the FIA, tyre supplier Pirelli, sponsors and circuits. To be able to make a rule change during a World Championship, unanimity is needed. In this case, that did not happen. The year started with the 2015 qualifying format in place, only for Ecclestone to decide he wanted a change in an effort to spice up the racing weekend. or keep the 2015 arrangement and have the top eight re-ordered afterwards, moving the fastest cars backwards on the grid. They went for the elimination format, something Mercedes F1 boss Toto Wolff described as the "least worst option". It remains to be seen what changes will be adopted - if any - after the Bahrain race, which takes place on 3 April.